Huge water consumption had been considered more and more for TBM projects, it will be a waste of money for the TBM contractors, they need a proper way to recycle the water to reduce the total cost and reduce the impact on the environment. Herrenknecht AG is one of the best TBM pipe jacking machine in the world, nowadays more and more contractors try to source the pipe jacking machine in China, because some good Chinese TBM manufacture improved the underground technology and quality a lot to make their machine competitive. GN solids control design and produce mud cleaning system/ water recycling system for TBM/ Tunneling and drilling waste management system. The normal design is with mud cleaning system and dewatering unit with dewatering decanter centrifuge, and water storage tank is included in the system to reserve the water, which could be reused for the TBM. We provide 2 types of dewatering unit, one type is containerized dewatering unit with everything inside the container, to prevent sun/ water/ rain/ cold temperature. The other type is without container, the cost is cheaper, but you need to install a sun proof cover on top of the dewatering unit in the jobsite. GNLW553C-VFD decanter centrifuge is the most common used decanter centrifuge for dewatering unit. It is the biggest model centrifuge we have now, the treating capacity varies for different mud, when it is used for drilling fluids, the treating capacity could reach 90m3/h, when it is used for TBM without dewatering unit, the treating capacity up to 60m3/h, when it is working with dewatering unit, the treating capacity will reduce a lot to 40m3/h, it depends on the mud weight and density. 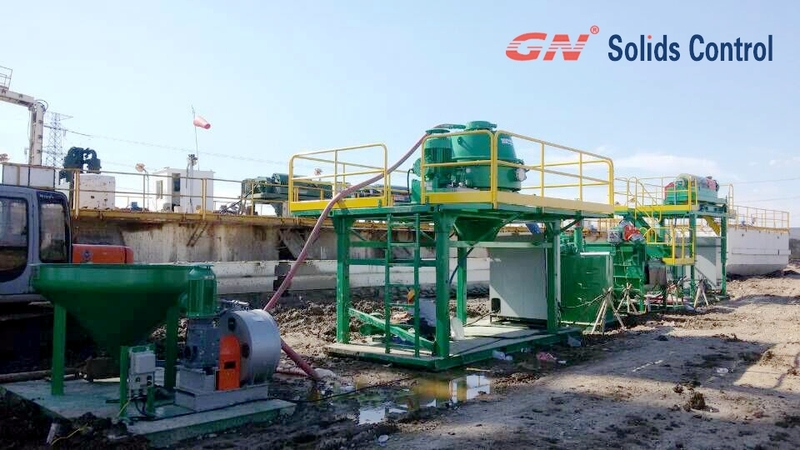 If you need to recycle the water for TBM projects or bored piles or other underground constructions projects, pls contact GN solids control for a customized solution.